Dental implant procedures can help you achieve that ideal smile and make it last a lifetime. Here at America Smiles, we will connect you with highly trained and skilled dentists to make sure your dental treatment meets your maximum expectations. In the world of dentistry today, there are a numerous amounts of procedures that take place and it may seem overwhelming. 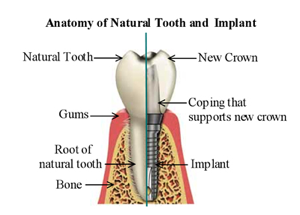 In its simplest form, a dental implant is an artificial tooth root. Its basic purpose is to hold a replacement tooth or a bridge or turn a removable denture into a fixed denture. Dental implants are an excellent choice for any patient that has lost a singe tooth, multiple teeth, or all of their teeth. Dental implants do not rely on any other teeth to support the artificial tooth or bridge. They are an excellent option for your dental health, because they can provide a full lifetime of smiles and convenience.There are two types of dental implants. There are endosteal implants which are placed in the actual bone. 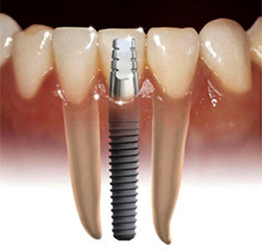 This type of implant replaces bridges and removable dentures. The alternative type are the subperiosteal implants, which are implants that are placed on the actual bone on top of the jaw with metal framework. This type is used for the patients who have minimal bone height and are unable to wear conventional dentures. Dental implants are a great option for the 50 million people in the U.S who wear conventional dentures, because it replaces the use of any adhesives. Detailed Implant Picture Dental implants can also help patients who are only missing a few teeth, because crowns and bridges are either cemented or screwed directly on the implants. Dental implants can also be used for patients that have only lost one tooth, however it is the most challenging use of the procedure. Not only are dental implants extremely beneficial, but they also have a great success rate. The success rate of implants on the front portion of the lower jaw is 98 to 100% The upper jaw success rate is 90 to 95% Finally the back portions of the upper and lower jaws is 85 to 95% success rate. Although a very successful procedure, implants take time. They must be set for about three to four months before they can be used as an anchor for the replacement teeth. Looking for a dentist who does dental implants? Check out our dental implants provider page to find one near you!